(Reuters) The spoof heavy-metal band immortalized by the mock documentary "This is Spinal Tap" has reunited to join a campaign to save the world from global warming. Director Rob Reiner, whose 1984 film set the bar for the "mockumentary" genre, has made a new short film called "Spinal Tap" as part of a campaign dubbed SOS/Live Earth. The band will also play in London at one of 7 Live Earth concerts on July 7. "I'm here today to talk about something even more important than me or extremely loud music," Reiner -- in character as film-maker Marti DeBergi -- says in the new film which is to help open the Tribeca Film Festival on Wednesday. "Spinal Tap" and eight other short films -- the first of 60 that have been commissioned for the campaign -- will be posted on the Web site www.liveearth.msn.com from Thursday. In Reiner's original film, he plays documentary maker DeBergi who accompanies the fictitious English band Spinal Tap on a U.S. tour. The film became a cult favorite as a satirical send-up of the music business. In the new film, Reiner, reprising his role, takes credit for coining the term "global warming." The band members discuss their long history of charity work, such as campaigns to help ferrets -- by raising money to feed them Caesar salad -- and to help people with high insteps. "Spinal Tap" will be a highlight of Wednesday's opening night gala of the Tribeca Film Festival, which was created after the September 11 attacks as a way to revitalize downtown Manhattan after the destruction of the World Trade Center. The gala will be hosted by former Vice President Al Gore, whose environmental film "An Inconvenient Truth" won an Oscar for best documentary earlier this year. 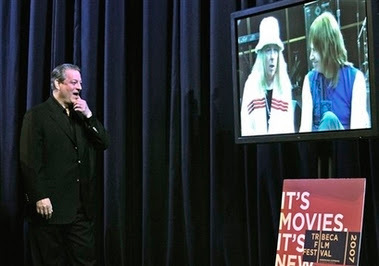 Describing himself as a "recovering politician" rather than a filmmaker despite his Oscar success, Gore said the SOS/Live Earth campaign and the short films aimed to show people how they can make a difference and help the environment. "Solving this crisis means first of all getting the attention of people all over the world for the fact that we do have a planetary emergency," Gore told a news conference at which Reiner unveiled a clip of his film. Tribeca Festival co-founder Jane Rosenthal said the environmental theme was a natural choice for a festival born out of "an act of war" and which has consistently shown films aimed at provoking debate. "The festival's initial goal was to help bring people back to the streets of lower Manhattan," Rosenthal said. "Now our goal is to help bring people back to their senses." The 157 feature films and 88 short films include plenty on weighty issues such as genocide in Darfur ("The Devil Came on Horseback"), a homosexual love affair between an Israeli and a Palestinian ("The Bubble") and U.S. soldiers' treatment of detainees in Afghanistan ("Taxi to the Dark Side"). On the lighter side, "Spider-Man 3" will have its U.S. premiere at Tribeca before it opens in theaters on May 4.